The findings come from the UK’s first Dark Web Market Price Index by Virtual Private Network (VPN) comparison service Top10VPN.com. 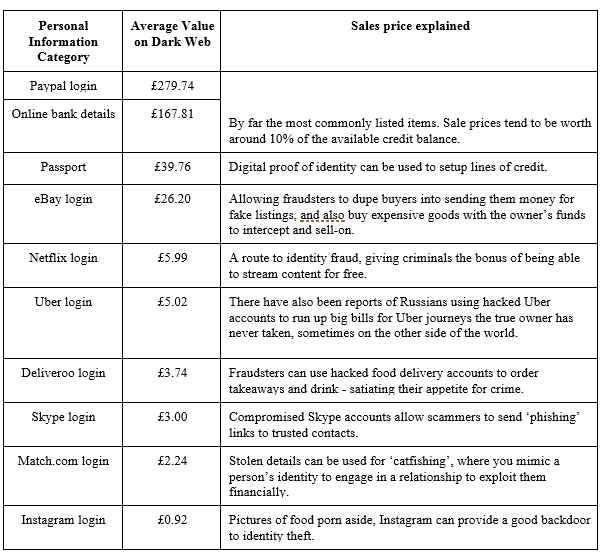 Bank account logins, passport details and even access to your Netflix account are worth money to bidders on dark web markets - but the low price point of this information will spark concerns that valuable personal details are all too readily available to would-be swindlers online. The average person has dozens of accounts that make up their online identity - all of which can be hacked and sold. Top10VPN.com’s team of security experts reviewed tens of thousands of listings on three of the most popular dark web markets, Dream, Point and Wall Street Market. The research found that while bank details will fetch in the vicinity of £168 and Paypal logins around £280, many important personal details are changing hands at a much lower price point. Dark web bidders can get hold of your passport details for as little as £40, while access to online shopping accounts such as Amazon and Tesco are rarely worth much more than £5. Even eBay accounts with their broad scope for fraud fetch just £26 on the dark web. On the dark web, even logins to dating sites like Match.com are valuable, and tend to earn bidders on average £2.24 - allowing criminals to ‘catfish’ potential matches, sparking up relationships to manipulate people for financial gain. Despite the importance that some attach to sharing sites, social media accounts such as Twitter and Instagram are amongst the least valuable on the dark web - although they do provide a useful backdoor to fraudsters planning to commit identity theft. Simon Migliano, Head of Research at Top10VPN.com, says: “It might come as some surprise that on the dark web your entire personal identity can be bought for significantly less than the price of a new iPhone X. Methodology: The team reviewed all fraud-related listings on three of the largest dark web markets, Dream, Point and Wall Street Market over 5-11 February 2018. Relevant listings were collated and categorised in order to calculate average sale prices. Prices were collected in USD and converted to GBP at the current exchange rate at the time of listing ($1.39 rate).